Give your Dad, Grandpa, Uncle or Brother a Personalized T-shirt they can be proud to wear: one of these Mr. Fix-It Personalized T-Shirts. The Personalized Shirt for the man who can fix anything and has every tool. Your Custom Printed Handy Man Shirt is Available on our premium white 100% cotton Personalized T-Shirt, machine washable in adult sizes S-3XL. Also available in Ash Gray. Includes FREE Personalization! 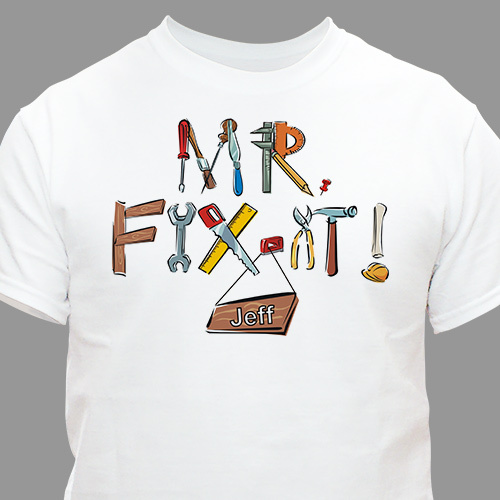 Personalize your Mr. Fix-It T-Shirt with any name. I was very happy overall. It was made very well! Father's Day is a special time of the year to recognize the special things your Dad, Grandfather, Papa, Grandpa or Uncle do for the family. At GiftsForYouNow.com we offer many Personalized T-shirts that are perfect for Father's Day. In addition to our Personalized Father's Day Shirts, we offer affordable Personalized Fathers Day Frames, Personalized Father's Apparel & Personalized Fathers Day Keepsakes.